The two-point gap marks the slimmest margin between them to date. Since Brown, a former U.S. senator from Massachusetts, entered the race in April, he had trailed Shaheen by about 8-12 percentage points. 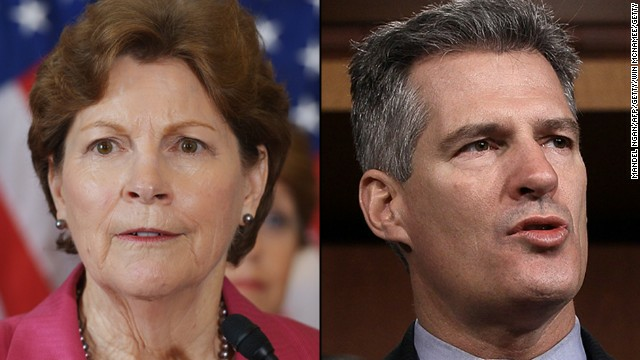 Shaheen's numbers may be affected by national politics, according to a release about the poll. President Barack Obama has a 37% approval rating among likely voters. While Shaheen holds more than 90% support among that group, Brown holds 71% support among the 59% who disapprove of the President. Colin Reed, a spokesman for Brown, said "polls will go up and polls will go down, but Scott Brown is going to continue working hard, holding town hall meetings, taking his message directly to the people and earning every vote." Republicans consider New Hampshire a potential pick-up seat in their quest to retake control of the Senate. The GOP needs a net gain of six seats to win the majority. Brown joins two other Republicans who are running for their party's Senate nomination in New Hampshire: former U.S. Sen. Bob Smith and former state Sen. Jim Rubens. The poll shows Shaheen has a double-digit lead over Smith and Rubens. The winner of the September 9 primary will face off against Shaheen, who also served for six years as the state's governor. For the poll, the University of New Hampshire Survey Center interviewed 827 adults in the state by telephone from August 7 through August 17. The poll's sampling error is plus or minus 3.4 percentage points. CNN's Ashley Killough, Paul Steinhauser and Sean Kennedy contributed to this report. "The answer to too much salt in a sauce, is to add more salt, really, that makes sense to you, honestly?" Oh, absolutely. Too much salt makes one thirsty. If we are to believe polling data, making one thirsty IS the goal. The more thirsty we become, the more likely the GOP will win. They hold the water bottle; dabbling a little here - a little there; and the believers come out from under their rocks, pleading for more. Guess the thirsty still haven't figured out who put them under the rocks to begin with. Too busy pleading, I suspect. Dear Residents in N.H, you are smart enough to figure out that President Obama (D) and Democratic U.S. Senate want to save illegal immigrants of 11,000,000 plus 300,000 invaders who's broken our border. However Obama has failed to save one American great Journalist. American can't trust the President and the Democratic U.S. Senate any more. Is the right wing that amoral that they would turn that tragedy into a political football? Yup, you betcha. Someone on the ticker is now a fundraiser? I never knew. Plus, once again, apparently it's not amoral to you when dems were fundraising off of Sandy Hook. That was perfectly fine to you. @Rudy-I gotta agree with you on that point. Good, Here's some more food for thought. Both sides did try to push a political agenda following Sandy Hook. What was it, something like 90% of people polled [read bi-partisan support, both sides doing it] wanted to enact common sense gun control that would keep deadly weapons out of the hands of the mentally ill. Unfortunately, Republican politicians would have no parts of it. Rudy NYC @ smith @Rudy-Speaking of using a tragedy to further advance a political agenda. Remember the left using Sandy Hook to push their gun control agenda? They both do it, Bucky. You might have a point. Both do it. The right used Sandy Hook to promote gun sales. "....good guy with a gun." I noticed that you haven't commented on my post on the first page of comments. Is love to get your response and thoughts.